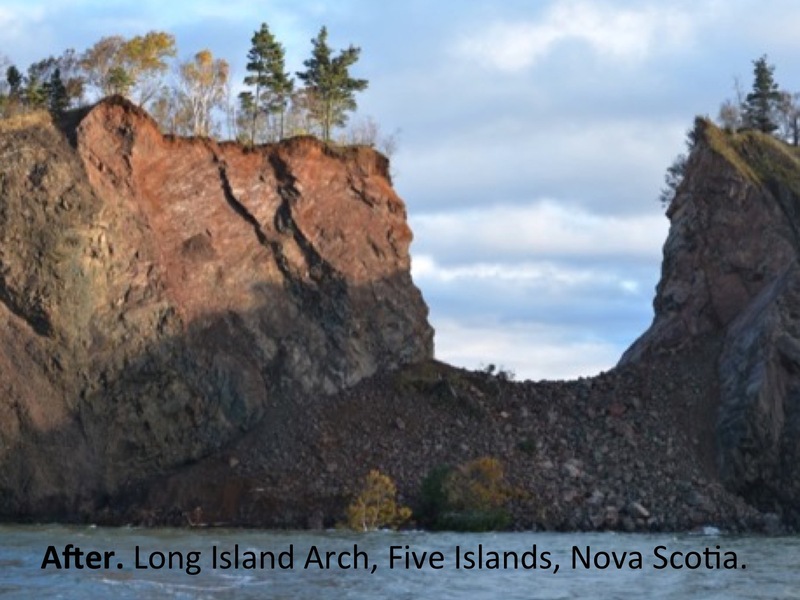 Residents from Five Islands and other visitors will share information about the Long Island Arch, at a Community Meeting scheduled for November 1 (1 – 4 pm) at the Fundy Geological Museum. For more information on that event see the Facebook Event posting. The rock that makes up Five Islands is basalt, a hard igneous type of rock that forms when molten magma cools. The basalt at Five Islands was formed 200 million years ago, when Canada’s oldest dinosaurs were roaming this area. The dinosaur footprints are also found at Five Islands in the sandstone deposited above the basalt. The basalt rock at Five Islands formed when magma flooded to the earth’s surface when the supercontinent Pangaea broke apart. The magma (called the Central Atlantic Magmatic Province) covered a huge area 5000 km x 2500 km. The extrusion of this large amount of magma 200 million years ago caused a global mass extinction at the end of the Triassic Period. There were also massive earthquakes in the Bay of Fundy at this time as the supercontinent continued to separate. 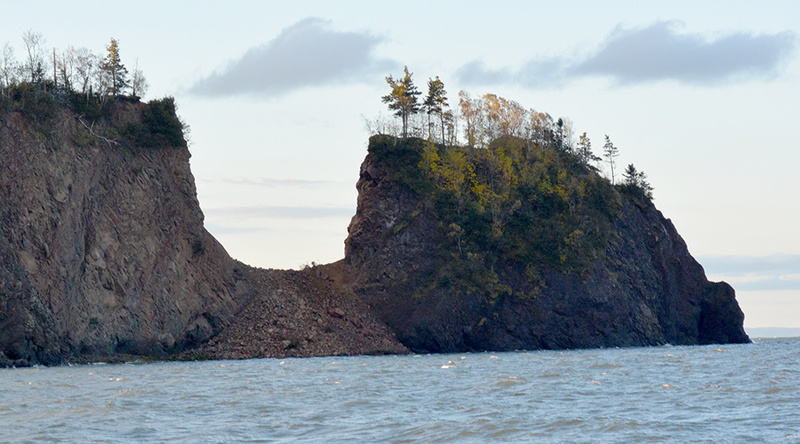 The cooled magma (basalt) all along the Parrsboro Shore of the Bay of Fundy was cut by earthquake faults, forming weak zones in the basalt rock. The earthquakes 200 million years ago caused a weak-zone in the rocks at Long Island, and also cut through the bones of the dinosaur bones found in the area. The above two images are taken from a slightly different vantage point (low tide and high tide). 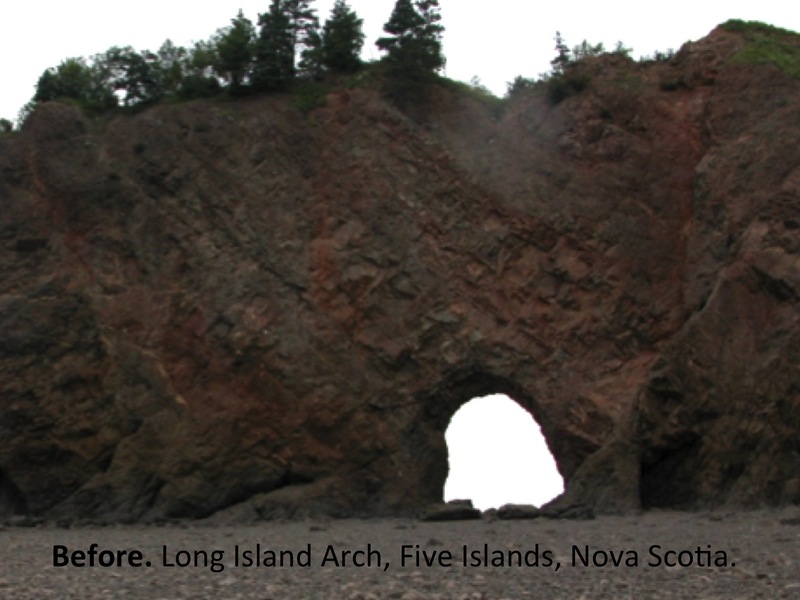 Although the left and right edges of the image are not lined up, it is possible to line up the rock surface near the arch. 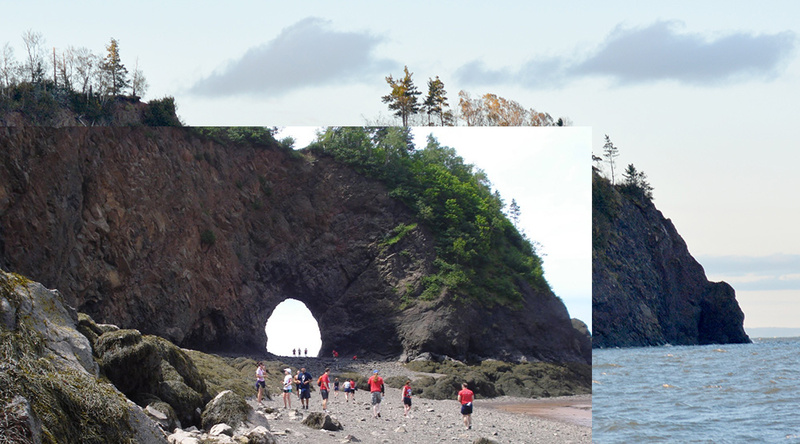 The view of the arch with the runners was found on Google Earth, the photo of the arch after the collapse was taken October 22 (Fundy Geological Museum). The above slider images show the collapse from the south side of the island. Most of the rock has fallen on south side of the island. The photo taken after the collapse shows a large fault slikenside surface on the left edge of the collapse. NOTE: The island is private property and remains dangerous due to ongoing erosion of the cliff until it stabilizes. LIKE the Fundy Geological Museum Facebook Page to learn more. You can help support new research. 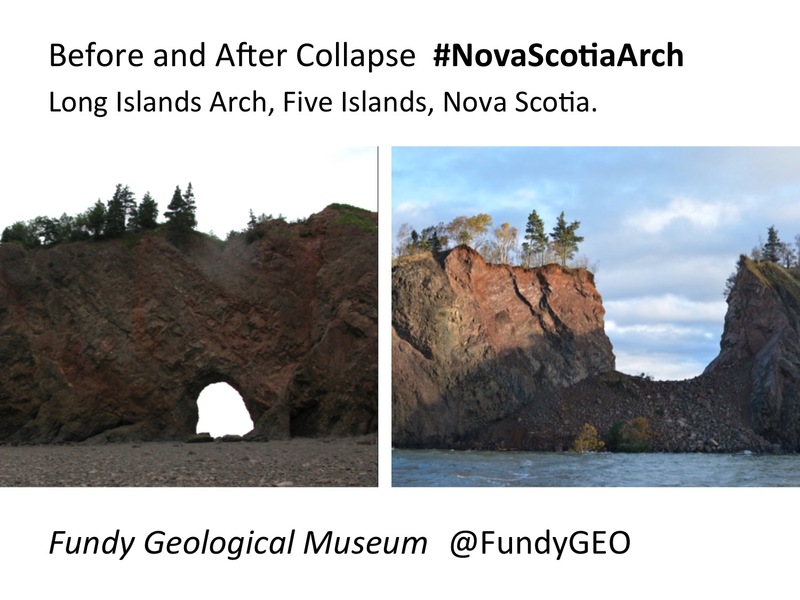 All donations to the Fundy Geological Museum are directed to new research and education projects. Earthquake Dinosaurs. All Rights Reserved.